Almost never get pick-pocketed again! Those who lives in busy city areas, there is a high possibility that he got pick-pocketed at least once in his lifetime. Mobiles and wallets are the prime target of the pickpockets and losing those costs you badly. Here’s some tips to get yourself bulletproof security from the pickpockets. Crowded places are the heavens for pickpockets. Places like concerts, bus stops, carnivals, etc. are filled with them, so be extra careful in those areas. Often when we walk in crowd it is hard to avoid body collisions. Your body is then at vulnerable state and ignores any particular body contacts and even anyone pulls your wallet out, your body may ignore that slight touch. Pickpockets takes this opportunity and emptify your pocket. And if somebody just suddenly collide with you and smiles saying sorry and just simply walks by, check your wallet and mobile quickly! Don’t keep your wallet and mobile in the back pocket of your pant! Well most of the people keeps their mobile in their front/side pockets but eventually keeps their wallet in their back pocket. In a crowded place that is a huge risk and an open invitation to the pickpockets. So it may seem odd but keep your wallet in your side/front pockets, or even in your backpack if you are carrying one. Don’t ever keep anything at all in your Panjabi’s pocket. Yes, you heard it right. Just don’t! Even I can pick your pocket you if you are carrying anything in your Panjabi’s pocket! If anybody just falls in the ground, or dropped his/her stuffs, you may step ahead to help her out as you are a good human being. But make sure to secure your stuffs first! Ladies bag/mobile bag? 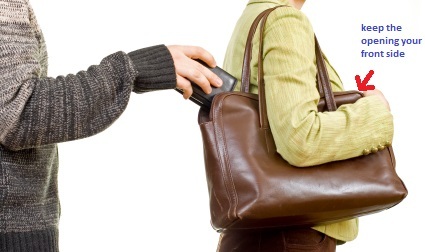 Easy as pie for the pickpocket..
Be extra cautious if you are carrying a ladies bag. Keep your purse opening in the front for better security, or its easy for the pickpockets. Don’t stay still for a while! Being still in a same place for a while is a tourist attraction for a pickpocket. Standing while you checking books in a book store, or enjoying a street magic show, it’s the prime position to make yourself pick-pocketed! So keep your body moving. If you can’t do that, you can keep your hands in your pocket or tap your pockets with your hands every once in a while to frequently check whether your things are in the right position or not.